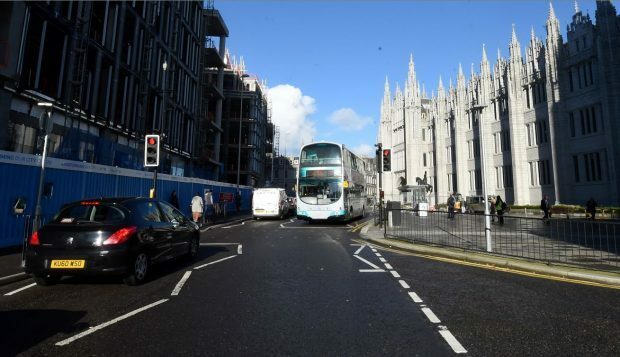 A bus giant has hit out at plans to close an Aberdeen city centre street to traffic. A spokesman for First Group has said that Broad Street remains “an important element” of the masterplan – despite fresh doubt being thrown on whether the street will be reopened to buses. Yesterday the city’s Liberal Democrat group they would put forward a motion at the next full council meeting on December 11 to ensure that no traffic can use the road. The current council plan is to open it again to buses and bikes once the £3.2million project is finished. Senior Aberdeen Labour councillors have also indicated they could rethink their position and the SNP group have also said they would consider a change of heart. But a First Aberdeen spokesman said: “The continued provision of space for pedestrians, buses and cyclists on Broad Street is an important element of the city centre masterplan. This is part of a shared commitment to encouraging modal shift and the use of sustainable transport in the city. “First Aberdeen customers have been inconvenienced for an extended period of time by the suspension of bus access on Broad Street and we are eagerly awaiting the reopening of this important corridor. “Safety is always our top priority and First Aberdeen puts in place a range of safety measures when operating bus services. These form part of our ongoing discussions with the council officers we are in close contact with in the run-up to the reopening.